GREAT BARRINGTON — Hunched over a pair of hazy photos, Emily Wagner maneuvers a tiny spatula to rearrange the torn and furrowed film that shows the chest X-ray of a missing Korean War soldier. It’s slow, painstaking work in a converted cotton mill in the Berkshires, but the payoff could be immeasurable. By putting its film-restoration skills to new use, a photo laboratory here is in the vanguard of a promising Defense Department effort to identify the remains of Korean War veterans, six decades after the conflict began. The project, for which the Chicago Albumen Works photo lab in Great Barrington received a $400,000 contract, also is close to the heart of Doug Munson, who owns the company where restored photographs of Abraham Lincoln, 19th-century Paris, and old New Orleans hang on the exposed-brick walls. By restoring the images, which actually are 1950s photographs of an X-ray screen, the federal POW/MIA Command hopes to match the pictures with remains to be disinterred from the National Military Cemetery of the Pacific, commonly called the Punchbowl. The X-rays, which contain the soldier’s names, were taken at induction. The starting point of a match, Byrd said, will be the telltale characteristics of the collarbone. “We’ve had so many cases here that just get stuck, because you don’t have that piece of information that you need to determine beyond a doubt who it is,’’ Byrd said. The expertise of Chicago Albumen Works, which Byrd said the POW/MIA Command could find nowhere else in the country, is critical because the formaldehyde products used in the processing of Korean War remains destroyed the mitochondrial DNA. “We were shocked and surprised to learn that, probably because of the way the remains had been processed, we can’t get any DNA out of them,’’ Byrd said. 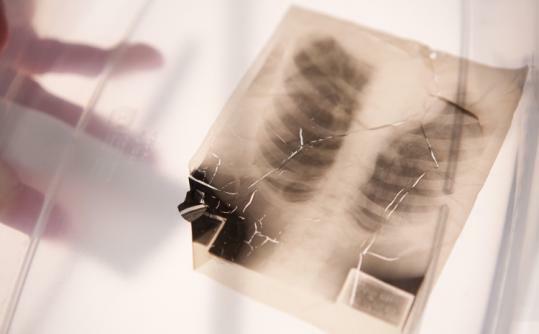 With DNA analysis no longer a reliable option, the command began searching for the X-ray images, which they knew had been taken because of decades-old references in papers on tuberculosis research. But another obstacle appeared, Byrd said. The X-rays, which had been largely forgotten, were about to be destroyed, they later learned, because of decomposition and the government’s plan to recycle the silver in them. The next stop was Great Barrington, which Carl Stephan, a forensic anthropologist with the POW/MIA Command, visited this spring with a small batch of images as a test project. When two matches were made in conjunction with Munson’s lab, an exciting new path to identification seemed possible. “The images that have been produced have been of excellent quality,’’ Stephan said, who learned of the lab through a recommendation from the Library of Congress. More than 8,000 veterans of the war remain missing or unidentified, said Larry Greer, spokesman for the Pentagon’s POW/MIA office. The recovery effort, by US teams working in North Korea, has been suspended since 2005 because of diplomatic tensions and concerns about the safety of the recovery teams, he said. “Technically, we’re still at war with North Korea,’’ Greer said. The 800 images that Munson is handling, nearly all of them from the Korean War, center on unknown remains that are buried in the Punchbowl. All unidentified remains from the war that are in US custody, about 850 casualties, are interred in individual graves in the cemetery. The bones of other casualties are still somewhere on the Korean peninsula, Greer said. “We are estimating that 200 or more individuals may be ultimately identifiable,’’ Byrd said, and that matches “in the majority of these cases’’ would rely on the X-ray images. The potential of the work has heartened veterans such as Tom Hudner, 86, a Medal of Honor recipient from Concord. As promising as the restoration work appears, the process is daunting. In addition to the lack of mitochondrial DNA, film of the early 1950s used a cellulose acetate base, which Munson said is extremely susceptible to deterioration that leaves the image discolored, obscured, and distorted by cracks and crinkles. “It takes infinite patience,’’ Munson said. By the Vietnam War, Munson said, cellulose acetate had been replaced by polyester, which is much more stable and lasting. The project is being conducted under tight security. After each improved photograph is scanned digitally, the data are stored in a locked hard-drive bolted to the wall. The computer images, along with the X-ray photos, are then shipped back to the POW/MIA Command. “This is another tool that the march of technology is offering to us,’’ said Greer, who added that the Pentagon has been charged by Congress with doubling the annual identification of US war remains by 2015. For veterans and technicians, the project has become personal. MacQuarrie can be reached at macquarrie@globe.com.